The IQAir HealthPro 250 is a powerful air purifier that delivers on its claims. Many of you would be doubtful and be asking the question whether paying over 1 lakh for an air purifier is worth it or not. However, it should be kept in mind that the device caters to a niche category of users that want better air quality in their homes, regardless of how much it costs. For those who suffer from breathing problems, It is one of the best options to choose from right now and anyone who is serious about the air quality inside their homes can go for it without a doubt. Air quality is something that we take for granted and it’s not until we experience a literal breath of fresh air that we actually remember its importance. The IQAir HealthPro 250 air purifier aims at reinvigorating those weary lungs and reminding both you and your body that there could be a safe place for breathing back home. However, this sense of serenity comes at quite a steep price, Rs 1,10,289 to be exact. So, is this air purifier worth your consideration? We find out. IQAir makes bold claims regarding the performance of the HealthPro 250 air purifier. The company says that it has a total system efficiency of ≥ 99.97% for particles equal to or greater than 0.3 microns and ≥ 99.5% for particles more than or equal to 0.003 microns. For reference, 1 micron is 1/100th the width of a human hair. The modular tower design of the IQAir HealthPro 250 comes equipped with three filters. The first filter near the base is a class F8 PreMax Filter, through which the air passes during the purification process. A class F8 filter is generally rated efficient in capturing particles ≥ 1 μm. However, by mini-pleating and using wet laid, non-woven glass microfiber material, the company says that its efficiency goes up and it can capture ≥ 55% at 0.3 µm particles. The filter has a surface area of 2.8 square meters and it traps both coarse and fine dust particles. Next up is the V5-Cell MG filter, which sits directly above the fan. 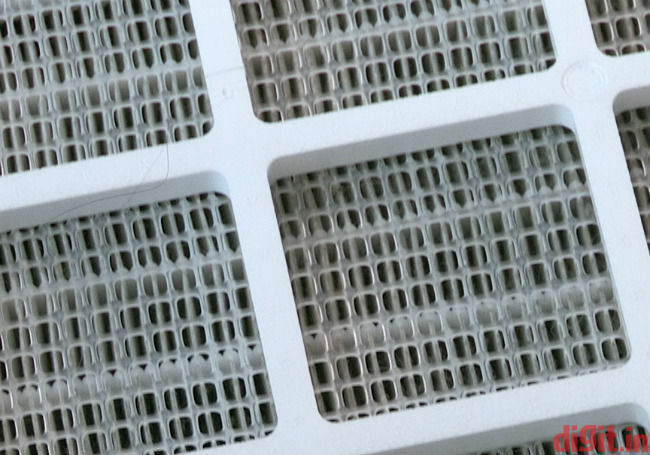 As complicated the name of the second filter is, it’s the company’s answer to a carbon filter that most air purifiers house for odour and chemical removal. The V5-Cell is a wide-spectrum MultiGas filter with 2.5 kg mix of activated carbon and impregnated alumina. The mix of alumina with activated carbon improves the filter’s efficiency for removal of a wide spectrum of gases and unpleasant odours. The top-most filter in the assembly is the company’s own hospital-grade class H12/13 HEPA filter. The class H13 end filters are generally used in demanding places like hospitals and can be highly efficient in removing particles as small as 0.01 µm. 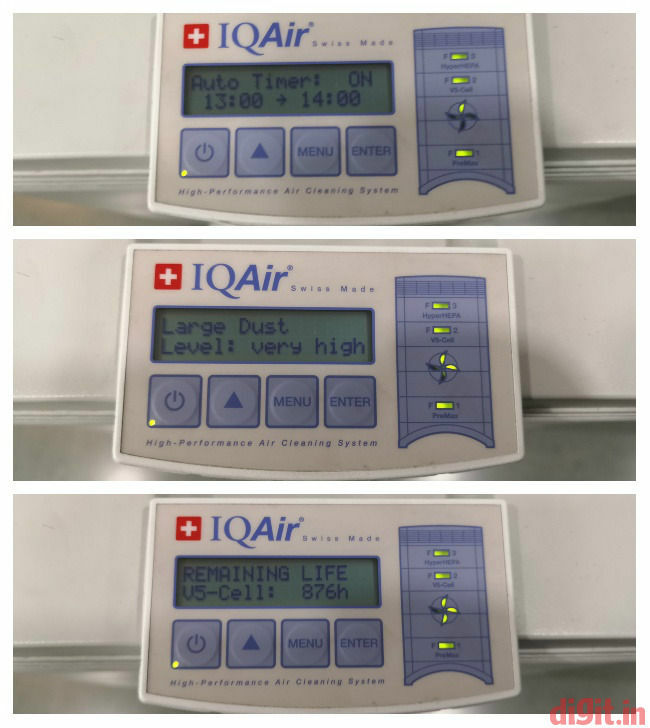 IQAir has used a five square meter large HEPA filter that comes with the company’s own HyperHEPA technology. It is said to filter ultrafine particles down to 0.003 microns in size, thus delivering par 95 percent cleaning efficiency. We had no way to actually test this claim, but as a jest, we placed one of our air quality monitors on the top filter when the device was operating. As you can see below, the PM1.0, PM2.5 and PM10 particle readings touched zero. Not many air purifiers can do the same. 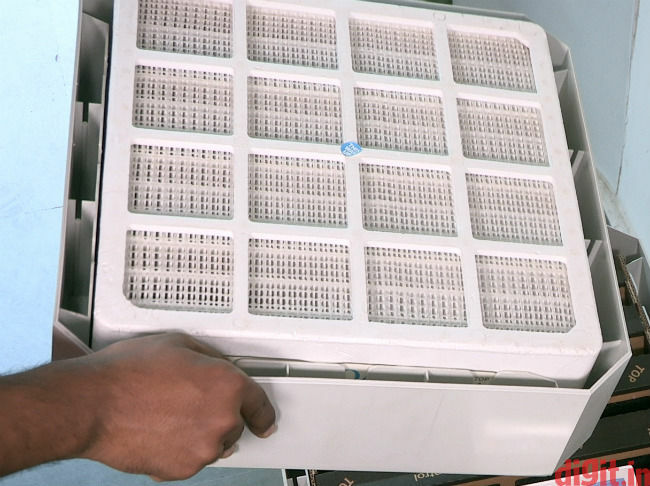 Additionally, turning the filter upside down is not a good idea as the accumulated dust can be released back into the air. However, the air purifier’s HyperHEPA filter is European Norm EN 1822 certified, which is a big deal as this means that the device is certified to be used in a clean room. 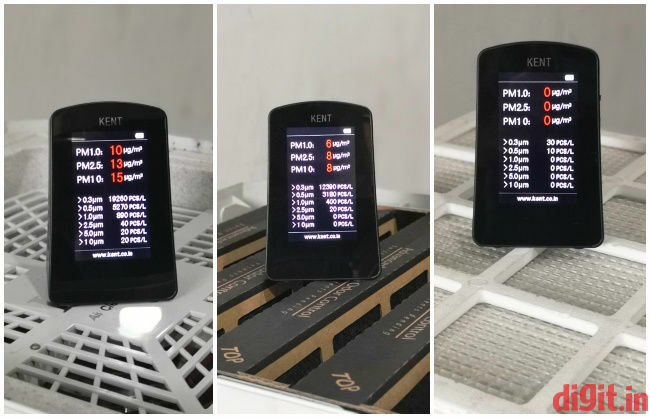 In order to find out how well the air purifier performs, we tested it in three different areas with varying amounts of PM1.0, PM2.5 and PM10 particles on days with dissimilar AQI readings. Two of the three places have a 10 ft ceiling height with an area of 120 sq ft and 190 sq ft, while the third area has a ceiling height of 12ft with 220 sq ft area. For simplification, we name the three areas as room no. 1, room no. 2 and room no. 3 respectively. We also used two air quality monitors to ascertain whether the air purifier is actually cleaning the air or not. Room no. 1 is situated in a heavily polluted area with a flyover nearby and construction work going on in close vicinity. Room no. 2 is in the same house as the room 1, but it’s kept much cleaner and has moderately lower particulate levels as compared to the first room. Room 3 is one of the conference rooms in our office, which has lesser indoor pollution. We selected these three spaces to diversify our tests so that one could have an idea of how the air purifier will perform where they live. Our standard testing procedure involves running the air purifier for 45 minutes and taking readings in-between to find out how much of a difference it made to air quality. Starting with the filters, we observed that hairs, pet dander and other larger particles are stuck to the base of the PreMax filter. This indeed is the primary responsibility of this filter, to make sure that larger particles are trapped here and even if not clean enough, more air is passed through. This is because the air flow becomes more restricted when other filters are introduced, hence the PreMax filter, which is also simply known as pre-filter on other air purifiers, is specifically aimed at removal of larger particles instead of fine filtration. For the V5-Cell MG filter, we tested its odours removal capabilities by introducing incense smoke, and spoilt, smelly food in room no. 2. We also burned some matchsticks in room no. 3. Considering that the odour intensity was ten at the beginning, after 15 minutes, it was down to a four. After five additional minutes, the odour was completely removed without a trace. Same can be said for the visible incense smoke, which fully disappeared after 13 minutes of switching the air purifier on. However, we noted that a distinct fruity smell replaced the odour of incense sticks, burning match and food and it seems like the V5-Cell MG filter gives off a mild smell of its own. We also attempted to purify the office toilet of its smell and the purifier performed well here too. The air purifier was expected to take a longer duration of time for removing harsher smells. However, it took around 20 minutes to almost completely get rid of the odour. 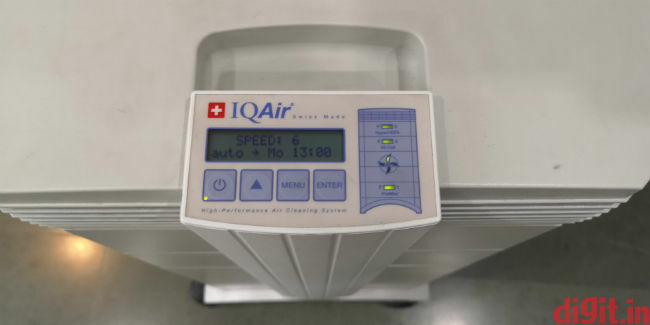 IQAir claims that the PreMax filter has an average filter life of approximately 18 months, while the HyperHepa filter is said to last for about four years if you use the air purifier daily for an average of 10 hours at the third speed level. The device’s speed can be set between six-speed levels. One needs to keep in mind that the filter life will be affected based on the level of pollution in their area and the number of hours the device is operated in a day. 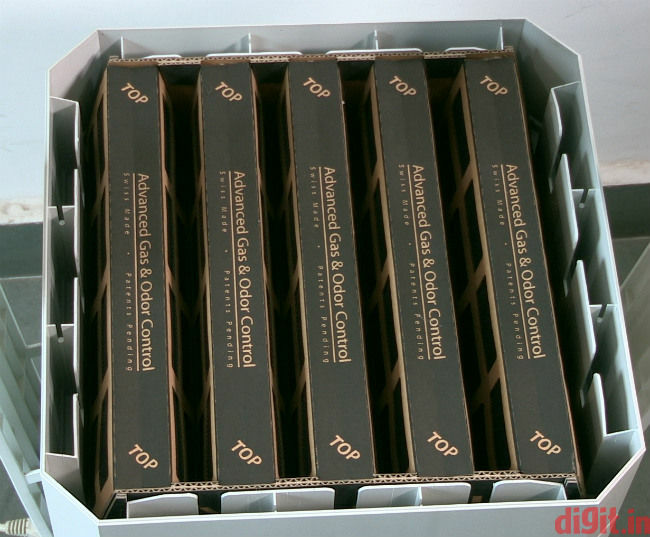 The filters also don’t require any cleaning and replacing them is easy too. However, same as the air purifier, the filters will cost you more than an average air purifier. The PreMax F8 filter will cost you Rs 7,827, the V5-Cell MG costs Rs 12,175 and the HyperHepa filter is priced at Rs 20,872. Let’s start with room 1, where the concentration of polluting particles in the air was highest. In our initial readings, PM1.0, PM2.5 and PM10 particle level concentration inside the room was 34, 45 and 46 µg/m3 respectively. The overall AQI reading inside the room was 93, even though it was 87 outside in Noida. 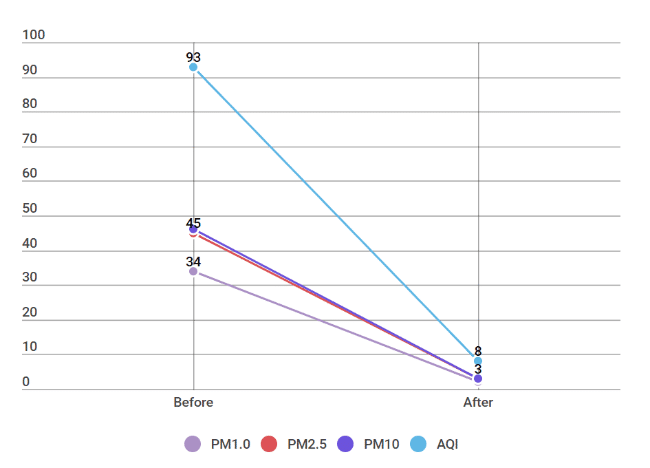 After switching the air purifier on and running it at the highest speed setting, it took less than twenty minutes to bring down the AQI to 8 and PM1.0, PM2.5 and PM10 levels to 2, 3 and 3 µg/m3 respectively. While reviewing other air purifiers, the overall AQI readings never dropped this low, this fast. Same was observed in room no. 2, which is comparatively cleaner than room 1. Here, the overall AQI before commencing the test was 75 and it again dropped down to 8 in under 20 minutes. The particulate levels were slightly lesser than room no. 1 to begin with, but they were lowered to similar levels. Room no. 3, our conference hall, was not heavily polluted to begin with. However, when particulates in the air are already low, it becomes difficult for an air purifier to lower them down even further. Before switching the air purifier on, the overall AQI was 72 and the PM1.0, PM2.5, and PM10 levels were at 29, 35 and 38 µg/m3 respectively. After 15 minutes, the AQI came down to 46 with PM1.0, PM2.5, and PM10 levels at 16, 19 and 21 µg/m3 respectively. After 30 minutes of overall activity, these numbers dropped further down with the AQI level at 29 and PM1.0, PM2.5, and PM10 levels at 10, 13 and 13 µg/m3 respectively. Most air purifiers are unable to bring down particulate levels in the air by such a degree, but even if some of them do, it’s difficult to drive them down further. 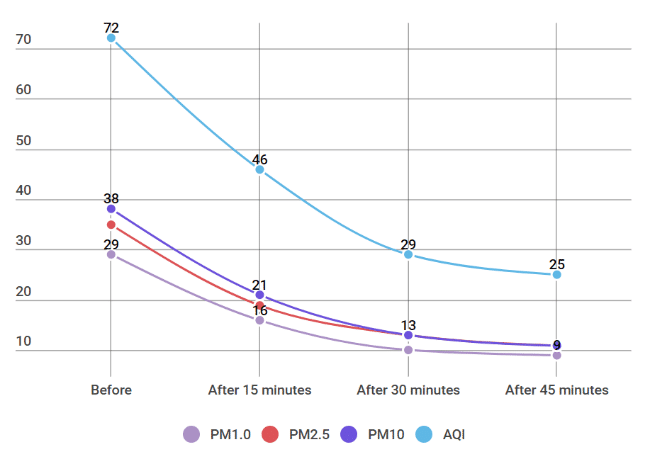 However, after 45 minutes, the HealthPro 250 was able to bring down the AQI level to 25 and the PM1.0, PM2.5, and PM10 levels to 9, 11 and 11 µg/m3 respectively. Unlike most other air purifiers in the market, the IQAIR HealthPro 250 actually delivers on its promises of cleaning the air of harmful particulates. If you have any breathing problems like asthma, or allergies, you will notice a major difference in the air quality inside your home under 30 minutes of switching on the air purifier. One of my colleagues is asthmatic and he used the HealthPro 250 for a couple of days. He says that he felt better and breathed much easier during the time he was using the air purifier. Now, if someone who is suffering from a breathing disorder says that the device is really making a difference in the air quality of his house, we can say that the air purifier is surely doing what it’s supposed to do. The IQAir HealthPro 250 has a simplistic design, which is a bit bland to be honest. However, the modular housing design makes it easier to replace the filters. The air purifier is certainly not going to blend into your regular home decor, but it could be mistaken for a smaller tower cooler. 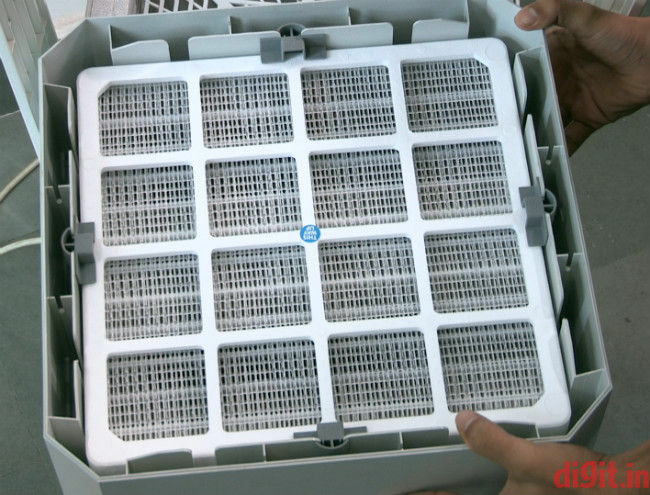 The device’s exterior is made up of ABS plastic and as mentioned above, the filters are stacked on top of each other. Starting from the bottom, there is a PreMax filter housing In the HealthPro 250, above which sits the motor fan. On top of the fan is the V5-Cell filter and finally, the top module houses the HyperHepa filter. 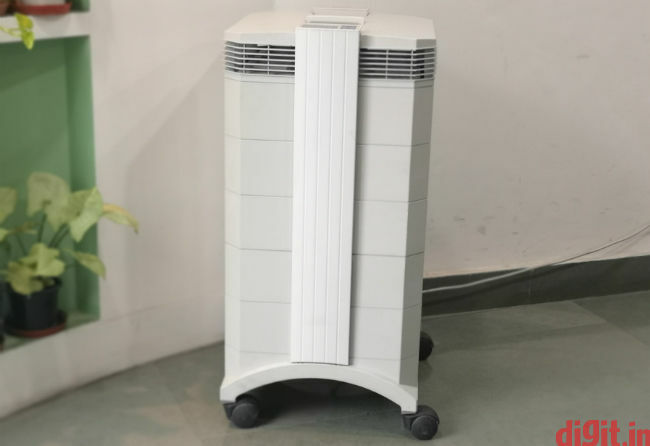 The air purifier weighs around 16 kgs and is difficult to lug around but it comes with a handle on top and wheels at the bottom, which are helpful in moving the device to some extent. The entire assembly is fastened into place by two clamps that snap into place on both sides of the air purifier. One of these clamps also has a small display on top, along with buttons for operating the device. Below the display are the on/off, Menu, Enter and navigation buttons. When the device is turned on, it automatically starts air purification at the lowest speed setting, at which there is a minimal sound disturbance. As you increase the speed, the sound grows obviously louder. We observed that it’s better to let the air purifier run at the max speed setting for 15 minutes and then lower the speed to three, which seems to be the midpoint for maintaining good air quality without much noise. Even though the IQAir HealthPro 250 excels in air purification, it misses out on features that most air purifiers come with. There is no app compatibility or IoT smarts and this means that one will not be able to control the device remotely. Additionally, the air purifier does not show any real time particulate matter or AQI readings on the embedded display. So, one would need to rely on external air quality monitors to find out the extent to which the air has been cleaned. IQAir could have at least made the device app compatible, using which one could have an idea of the current air quality inside their home. Although one will not get to use an app to operate the device remotely, the integrated controls enable timer programming. Using the feature, one can have the device turn on automatically at specified times on any day of the week, at whatever fan speed they like. The device automatically calculates and displays the remaining filter life by taking actual use, fan speed and programmed pollution levels into account. There is an LED light that will notify the user as to when it’s time to replace a filter. The IQAir HealthPro 250 is, without a doubt, one of the best air purifiers that money can buy. It performs well in all kinds of conditions and is brisk to filter out the harmful particulates inside your home. There are some drawbacks too as the device is way more expensive in comparison to most other air purifiers in the market at Rs 1,10,289 and also lacks app and IoT functionalities. The device sets a benchmark when it comes to performance, but takes a hit on our value for money statistics. However, if you are someone who is suffering from a breathing problem or simply want good air quality inside your home regardless of the costs, then the IQAir HealthPro 250 air purifier will definitely suit your needs. In case you are looking for something less expensive, more portable and app compatible, take a look at the Xiaomi Mi Air Purifier 2 or the Dyson Pure Cool Link air purifier. If you need an air purifier with great odour cleaning capabilities as well, then check out the Kent Alps Air Purifier. PC always booting in safe mode. Please Help. Seasonic S12II 520W - will this do?